…three summers ago, on a morning not much different than today. Sun shining. Texas heat already showing itself. My first stop was to see the radiologist for a breast biopsy (following a questionable mammogram). Later I visited the kidney doctor for my annual check-up. Hit it all in one day is how I like to approach doctor’s visits. While visiting with my kidney doctor, we began our normal back and forth banter—that’s how we always start—a man with a keen sense of humor! A few minutes into the exam, he got his serious face on, and started doing his doctor-thing. As I’ve witnessed him do on many occasions, he closed his eyes, concentration setting in, leaned forward, and readied himself to listen closely to my heart. As he went to place his stethoscope in the area of my heart, I noticeably flinched; he had accidentally grazed the area where my breast biopsy had taken place earlier that day. He opened his eyes and saw that my chest was wrapped in an ACE bandage. Clearly, I had some ‘splainin to do. “Oh, I just had a breast biopsy thing this morning. Whatever….” My voice trailing off. But here’s the truth…something I’m coming clean on now: at that point, I already knew it was a big deal. I somehow knew I would receive a diagnosis of breast cancer resulting from that morning’s biopsy. How, you ask? Obviously, the results weren’t in—I had just had the biopsy a few hours earlier. Here’s the deal: I. Just. Knew. I can’t tell you how I knew, I just did. These were all things I KNEW before I had any official consultation with the breast surgeon or oncologist. I think you would agree, those are all pretty big things to know. At the time, this totally baffled my very left-brain-self. But I soon came to embrace that it didn’t need to make sense. It simply Was. It was My Truth. And it was this Truth that saw me through what would have otherwise been an extraordinarily stressful time in my life. 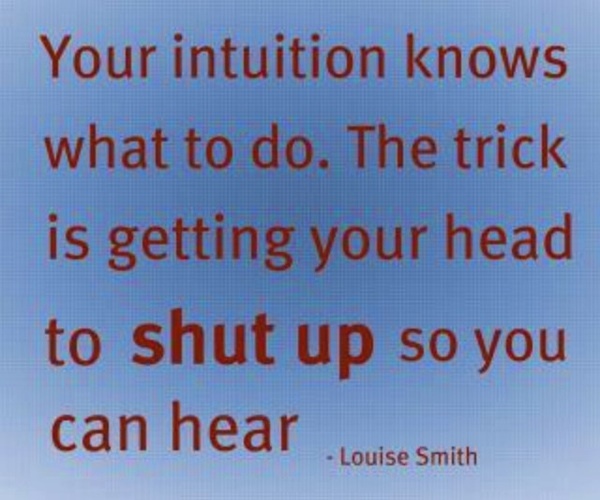 Around that time, I recognized that my intuition, gut, whatever you want to call it, was spot on, for the BIG stuff. But the small stuff often evaded me. Let me be clear: I have no problem making decisions and being okay with them, because of my belief that there are no wrong decisions. If, after you make a decision, you don’t like the outcome, then just make another decision. Whatever you chose occurred for your continued learning and growth, so there’s no use worrying that a “wrong” decision was made. There’s no such thing. But choices and decisions are not what this post is about. I’m talking about intuition. How could I know such big life stuff beyond the shadow of a doubt, but not be led by the same power within me for the smaller stuff? It obviously lived inside me. I was able to access it, but not for the everyday, small stuff. Why not? When faced with big life events, we are easily able to tune-out the chatter; we simply cannot be bothered with the minutia. It’s as if we are able to shut out all of the noise that normally exists, and with laser vision, see what is real. And we do it with no effort. It’s an unconscious action, one that results in our Knowing. However, when it comes to smaller things in our lives, things that don’t matter quite as much, we allow ourselves to become distracted, latching on to every minor detail. We fill our heads with a multitude of options, weighing each, maybe even making a list of pros and cons, comparing labels, etc. We go back and forth, sometimes to the point of mental paralysis. When this occurs, no decision is made. You are left with the feeling of anxiety, knowing that a decision still looms in the distance, and you’re no closer to a verdict. You’re standing in the sock aisle at Target, looking at 32 different types of athletic socks wondering, which ones are THE ones? The ones that wick away perspiration? Or what about these? They wick perspiration and have an anti-odor thing going on. And what about the length? They are so varied: these are AT the ankle, these are ABOVE the ankle, and these are so low, I bet they’ll slip down in my shoe. That would be annoying. Plus, I could get a blister. Oh, and these have this extra band that pushes up on the arch of my foot. I wonder if I need that? I wonder…. I wonder…. So, now what? Do you leave Target with no socks? Or with all 32 different types of socks, each with their unique variety of winning selling points, colors, cotton blends, price points, and packaging? How do you gain that laser sharp, strong inner gut feeling on a regular basis? And then you Trust yourself. A situation occurs and you don’t know what to do. Before you begin to create a list of options, analyze them, weigh them, ask your mother, best girlfriend, sister, neighbor, or the person standing next to you in the checkout line what they think: Stop. Don’t allow any additional chatter to begin. Feeling, listening, even seeing a vision in your mind’s eye, are the same in this context. Feel what you are drawn to. Listen. Tune-in to the first heart-tug you feel or whisper you hear. Now go for it! Seriously. Go for it! Don’t second guess yourself. Be content with your decision—it was based on your intuition, your inner guide who knows, even when your rational self continues to question. Now you’ve added the Trust component to the Stop and Listen pieces. It is this third bit, the Trust piece, that seals the deal. Start small. Start where you know you’ll be challenged, yet where the risk is low. Just start. Then repeat. Then repeat again. 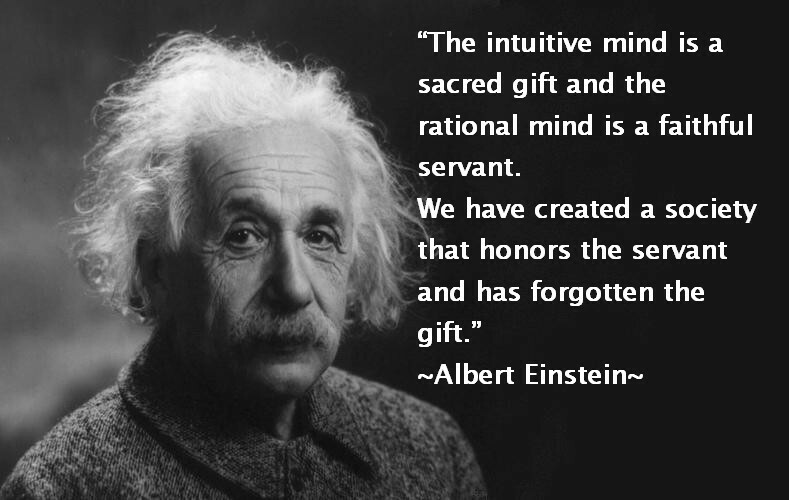 Why Unlock Your Intuition At All? I think you’ll be surprised at how quickly your brain (and heart) picks up on your new habit. Before long, you’ll not only be cruising through the grocery store with ease, but also cruising through life! You may even cruise through a cancer diagnosis…if there is such a thing. Whatever your situation is: large, small, or somewhere in between, tune in to your inner voice and feel the comfort that can be gained from Knowing, “I am well. All is well.” Your new found every-day-intuition will bring a constant level of peace to your life that you’ll grow to love, feeling as if someone has placed a warm, loving cloak-of-peace around your shoulders on a damp, cool evening. Keep it simple: Stop, Feel/Listen, and Trust. 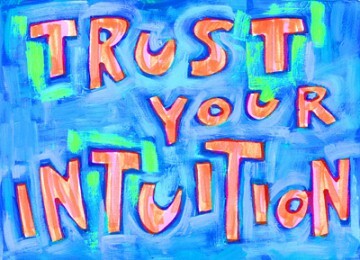 Those are the keys to unlock your intuition. There is something powerful about simplicity. If today’s message spoke to you in any way, won’t you please share it on Facebook and Twitter? You never know, it might be *just* the thing someone in your tribe is looking for. Thank you! Leslie Green is the writer and creator of TrustLifeToday.com. When not writing or speaking about trust, she can be found somewhere quiet sipping a cuppa tea or at the Pilates studio, either teaching or taking classes. Leslie is a breast cancer Sur-Thriver and lives in north Dallas with her husband, two sons, and yellow Lab. In the Future, Will Healthcare Be Reserved for the Rich?